American. 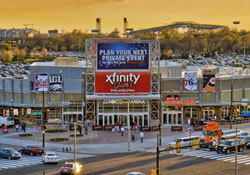 Venues include: Spectrum Grill, Victory Beer Hall, NBC Sports Arena, PBR Bar & Grill, and Broad Street Bullies Pub. 10/15/2014 Wicked: 6 Evil Parties Under One Roof at XFINITY Live! 10/15/2014 A Nightmare on Broad Street at XFINITY Live!